“100 Year Celebration” – It’s 1937. Friends and neighbors join family to celebrate 100th anniversary of ten Boom watch business. “These Are My Riches” – Casper “Papa” ten Boom, sings to his daughters Corrie, Betsie and Nollie about the real riches of his life. “Papa Ticks” – A watch maker, Papa carries many watches inside his coat. Children love to put their ear to Papa’s vest to listen. “Power To Change The World” – Dramatic duet by Papa and a young watchmaker he hires, who turns out to be a Nazi youth. “All the Strength You Need” – Nazis come to confiscate the ten Boom’s radio. Corrie and Betsie calm the fears of two young girls. “Kol Nidre” – (Sung by Marty Goetz) – Eusie sings this ancient Jewish prayer song at Papa’s request to hear him “sing the scriptures”. “Resurrection” – Casper ten Boom (a Christian) and Eusie (Jewish cantor) musically compare their personal faith. “My Hiding Place” – The ten Boom’s are arrested and taken. Six Jews hiding in the Secret Room are not discovered by the Nazis. “When Love Comes In” – Light-hearted flashback, Corrie, five years old, having a tea party. Corrie’s mother joins her in song. “Let the Child Believe” – Imprisoned, Corrie sings with Lt. Rahms, head of Ravensbruck concentration camp, during interrogation. “Old Dry Bones” – Lively discussion song by the fearful women in Barracks 28, questioning their fate at Ravensbruck camp. “Fleas” – Upbeat protest song. Women become bold, sick and tired of Barracks infestation of lice and fleas (“wee little Nazis”). “Perfect Love” – Musical theme song. Flashback to Corrie at 21, when she loses the one and only romantic love of her life. “Peace Song” – Women stand in roll call in freezing winter dawn, and risk padding their feet under threat of death. A prayer. “Imagine” – Giselle had mocked Corrie’s faith. Facing death she asks Corrie to help her make peace with God before Nazis end her life. 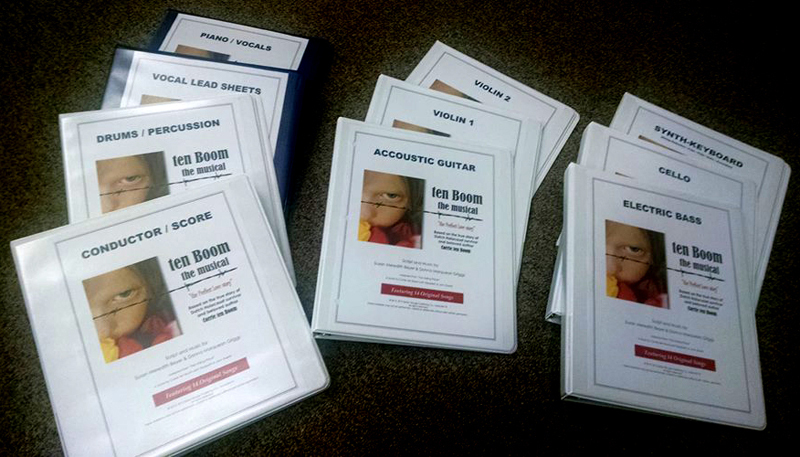 “Ten Boom” Orchestrations available upon request from performing venues.